Our painted and mango coffee tables make an elegant statement in your living room. 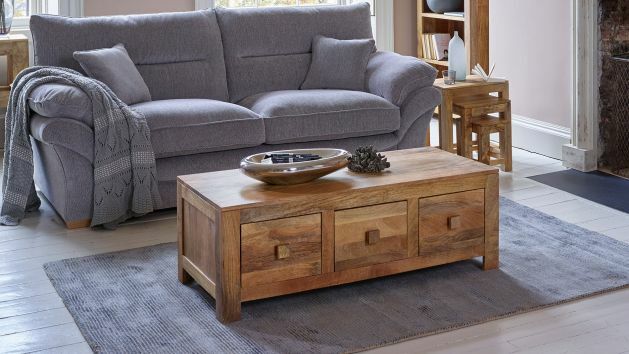 Make an elegant statement in your living room with one of our painted or mango coffee tables. They're designed to look fantastic in any interior design scheme. We make our coffee tables from only the finest of hardwood timbers, carefully sanded and painted to create a smooth finish. Finished in either exotic natural mango wood or our exclusive shades - country cream, soft dove grey, and a delightful truffle colour - work perfectly with your living room design. Perfect for resting a cup of tea while chatting with friends, or just showing off your remote in style. Browse all our painted and mango coffee tables, and find your ideal look today.